Editor’s Note: John Stevens was kind enough to pass along this letter by Willis J. Watts of the 1st Texas. This transcription is copyrighted by John Stevens and may not be used without his express written consent. 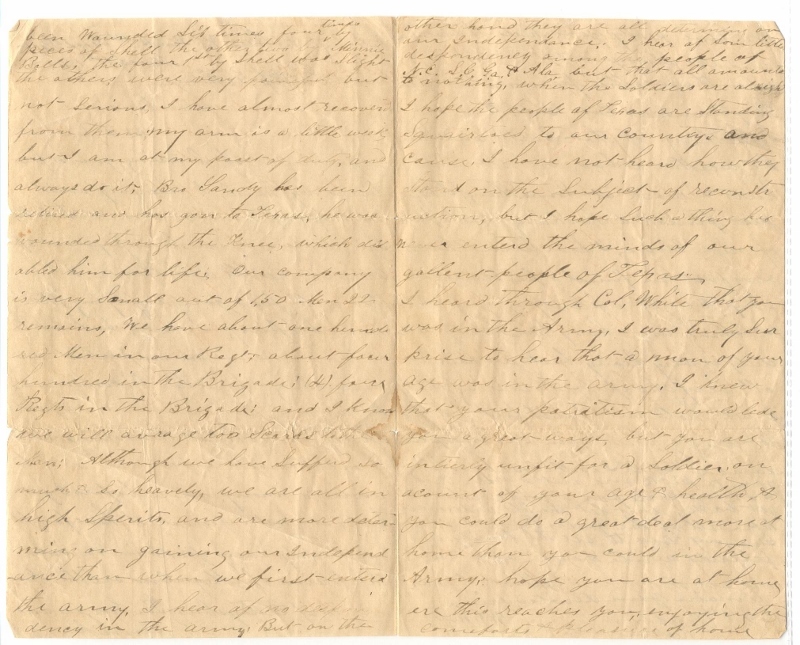 John also provided images of the original letter, which you can see by clicking on the two letter image links at the bottom of the letter. We have pretty good huts to live in and are always very lively & merry when the weather permits we often Play Town Ball Cat Bull Pin or Something of that Sort. and when the weather is bad, we Sit in our huts and work at Something. I have just finished hookling me a pair of nice gloves. I have learn to hookle very fast, can finish a par gloves in a day. we get a plenty of good ration & clothing and heavy Picket duty to do duty is very heavy but we bair it all very cheerfully, knowing that if we hold out faithful a little longer, we will gain our indepen-dance: well I will close by asking you to pick me out a nice Pretty & Smart girle for a wife when I get back. don’t let the old widerwers take all of the girles before I get back. Give my love to all the family, and friends write soon and give me all the news afloat. I ever remain your devoted friend. This letter has been transcribed from a copy of the original in possession of a descendent of Philip Gathings. The layout, spelling, punctuation, and sentence structure of the letter was transcribed exactly as written. The piece of paper which the original letter was written had been folded in half, making four segments like a modern greeting card. The page numbers were not on the original letter, but added to clarify the order on the front and back of the sheet. Page 1 was the front, Page 2 and 3 the inside, and Page 4 the back. Willis Watts biography: The 1850 Federal Census shows Willis at age 12, born in South Carolina, living with his parents Alexander and Martha Watts in Sumter County, South Carolina. The 1860 Federal Census shows him working as a horse breaker for James J. Gathings of Covington, Hill County, Texas. His parents lived in Anderson County, Texas. Willis Watts record of service: Enlisted at Palestine, Texas, Apr. 5, 1862, age 23; Private in Company “G”, 1st Regiment Texas Infantry, Hood’s Brigade; Wounded at Chickamauga (Sept. 19 & 20, 1863); Wounded at Wilderness (May 6, 1864); Paroled at Appomattox (Apr.12, 1865). 1 – Philip Gathings (my great-great grandfather) along with his brother, James, was one of the original pioneers in the Northern part of Hill County, Texas in the early 1850’s. 2 – At this time, the connection of kinship between Willis Watts and Philip Gathings is unknown. He may have been a cousin to Philip’s wife, Elizabeth White Gathings since he also mentions hearing from her father, Colonel White. 3 – The first and third letters of the name are difficult to decipher. Based on another letter Willis had written to Philip in 1861, this must be his brother Sandy. Three brothers of Willis also served in Company “G” of the 1st Rgt. All four enlisted at Palestine, Texas about the same time in the spring of 1862. Their names were Alex. J. Watts, B. F. Watts, and F. J. Watts. Sandy is most likely a nickname for F. J. Watts, wounded at Chickamauga, Sept. 19, 1863 and furloughed to Tex., Oct. 5, 1864. 4 – When first organized in 1861 a regiment normally consisted of 10 companies of approximately 100 men each. Four years of sickness, casualties, and missing had greatly reduced the strength of all CSA units. 5 – Col. White was the father-in-law of Philip. He lived in Anson County, North Carolina. He was elected to the N.C. State Assembly from 1820 to 1830. He had also served as a colonel in the state militia, but at age 67 he did not participate as a soldier in the Civil War. 6 – Philip Gathings was 43 when he enlisted for 6 months in Capt. Lyons Company “A” of the 4th Calvary Regiment, Texas State Troops from August 1863 to February 1864. He was stationed in Galveston, Texas during this service. In March 1864, Philip reenlisted for another 6 months in the same regiment and was stationed at Camp Murrah near Tyler, Texas. 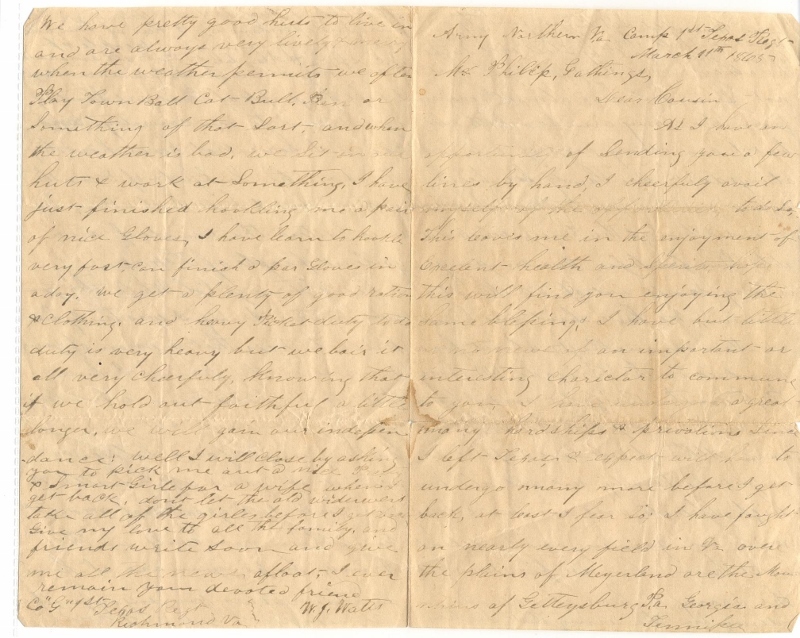 This letter gives insight of the morale and faith in the cause of one soldier of Hood’s Texas Brigade in the Army of Northern Virginia only a month before Lee’s surrender at Appomattox.